Our goal has been the development of adaptive, scalable, reusable and distributed infrastructure for the flexible reconfiguration of agent teams working with their human counterparts in intelligence gathering, information retrieval and fusion, decision making and planning--within rapidly changing contexts. Our work has focused on agent and agent system interoperability, especially in connection with the Grid. We have also developed the RETSINA (Reusable Environment for Task-Structured Intelligent Networked Agents) Agent Infrastructure and demonstrated the interoperation of the RETSINA Infrastructure with other agent infrastructures. Facilitating team decision-making has become more important due to increased decentralization of the military C2 process and the rapid restructuring of joint commands to keep pace with new forms of conflict and threats. Supporting collaboration and joint decision has become more and more difficult in the face of shortening decision cycles and new forms of warfare wherein the opponents are spatially distributed and difficult to identify, and where tracking and coordination of intelligence depends upon timely and effective access to distributed, and often disparate information systems. 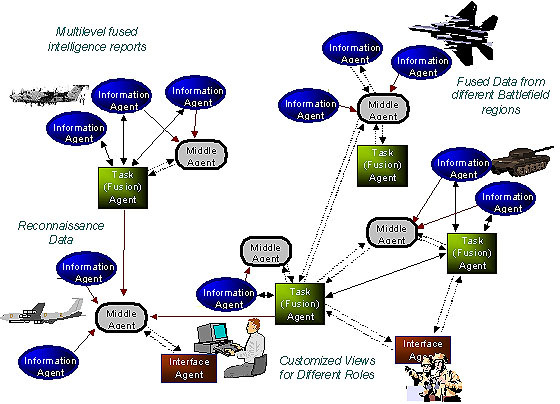 Our overall research hypothesis is that to effectively support teams in information fusion and decision making in a uniform and interoperable way, each team member and the team as a whole should be supported by a distributed collection of intelligent agents that cooperate to access and fuse information from distributed heterogeneous information sources, monitor information sources at many levels in a focused way, make inferences based on information access, determine new information gathering and fusion activities (e.g. new areas to search for threats, attacks and/or targets) based on their inferences, and provide customized views and alarms to the commanders and other members of the defense team. In accordance with this vision, we have developed multi-agent technology to support commanders and other defense team members with ubiquitous computing in real-time joint decision-making under novel, uncertain, and rapidly changing situations. Our work on the Grid and multi-agent infrastructure (http://www2.cs.cmu.edu/~softagents/retsina.html) is designed for decision support in an open, unpredictable, and dynamic information environments. User requests are appropriately and flexibly matched to information sources, whether distributed over the Internet or in other accessible information environments. We have designed flexible, extensible means to locate information relevant to a task during task execution, and to present information to a variety of devices and platforms (http://www-2.cs.cmu.edu/~softagents/mocca.html). Agent to agent communications has been developed to allow agents to autonomously find and semantically interoperate with each other, across distributed systems. 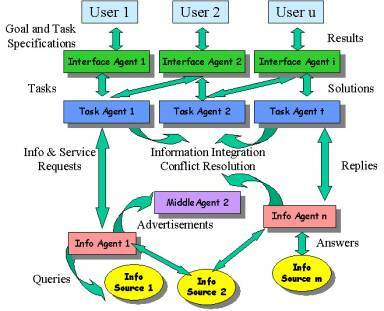 Interface agents receive the user requests and appropriately present information to the user. These agents use knowledge of the domain and the user role and functionality to help the user formulate and customize his/her information requests. They also plan appropriate interactions with other agents on the user’s behalf. Interface agents can also learn to anticipate user information needs and proactively pre-position information that the user has been observed in the past to need. Agents can also interface with “agentified” devices so as to negotiate the best way to present/acquire information for the human users of the agent system. Task agents have knowledge of the task domain and also have planning abilities. Utilizing the task models, and with planning, they are able to plan for a specific information gathering goal or an inferencing task. For example, they can decompose a high level information request (e.g. “find the state of readiness of a platoon”) to lower level tasks, and form plans for how to execute the information gathering subtasks, find (through middle agents) and query the appropriate information sources, and coordinate the query execution and composition of the query results. Task agents use planning mechanisms that combine planning and execution of the information gathering and inferencing tasks. Planning adaptively considers the current operational environment and the potential for changing resources. For example, some information sources may be present at one time but absent at another time (e.g., the source or its communication link could be damaged after an attack or during battle). Planning includes providing back-up information sources available for such contingencies. Information agents: each information agent wraps an information source and knows the particular details of how to interact with the source to answer a query. In addition to one-time access to information, an information agent can be given event monitoring and notification triggers called monitoring queries. For example, “provide me the status of X facility every 5 minutes”, or “provide me the status of X facility” if particular conditions obtain. Middle agents (http://www-2.cs.cmu.edu/~softagents/papers/ExtMiddleAgentsICMAS.pdf) provide varying degrees of semantic interoperability. They act as intelligent registries of agents. They allow service/agent discovery and lookup by semantically matching information needs of requester agents (or humans) with available information resources so that the requests can be routed to the available resources. The most popular Middle Agents are Brokers, Facilitators, and Matchmakers. We have identified 28 different types of Middle Agents and have experimented with different performance characteristics. Any agent or agent type can produce results that are potentially useful to other agents and agent types. Thus, any agent may wish to advertise its capabilities with a middle agent, so that it can be found and its services accessed. This capability-based coordination contributes to the discovery and semantic interoperation of agents, which is one of the most crucial challenges facing the transformation of the Internet into a Servicenet.